First job: My parents had a resort store in Watch Hill, Rhode Island. First job in real estate or allied field: A commercial real estate firm where I developed a love for the business. What do you do now and what are you planning for the future? 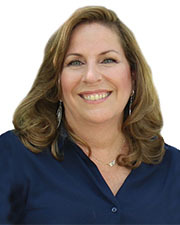 Karen Cohen Realty specializes in real estate in the Brooklyn market. We concentrate on retail and office leasing and sales. I value the relationships I have built and continue to serve their needs to help them achieve the highest possible dollar. How do you unwind from a busy day? Needlepoint but rarely have the time. Rules to live by in business: Always under promise and over deliver. If you could invite one person to dinner who would it be and where would you go? My mom, I miss her terribly. What is your dream job? Being a full-time grandmother.